Ukrainian President Petro Poroshenko speaks during a parliament session in Kyiv, Ukraine, Nov. 26, 2018. 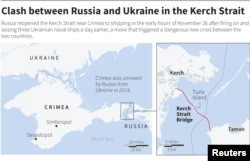 Russia said Tuesday that Ukraine's decision to impose martial law after Russian forces seized three Ukrainian ships and their crew in the Black Sea could lead to a flare up in hostilities in eastern Ukraine. 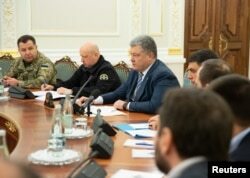 President Petro Poroshenko said martial law will help "strengthen Ukraine's defense capabilities amid increasing aggression and according to international law a cold act of aggression by the Russian Federation." 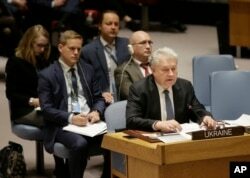 He added that Ukraine intends "to keep adhering to all international obligations." The measure calls for 30 days of martial law - an apparent concession to opponents - which would allow for elections to be called as scheduled in December. Ukraine is due to hold a presidential poll March 31, 2019. 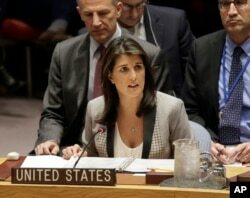 "This is no way for a law-abiding civilized nation to act," Haley said at an emergency meeting of the U.N. Security Council. "Impeding Ukraine's lawful transit through the Kerch Strait is a violation under international law. It is an arrogant act that the international community must condemn and will never accept." Ukraine's parliament is considering President Petro Poroshenko's call to impose martial law in the country, in the wake of the incident. If imposed, it would be the first time since the crisis between Moscow and Kyiv began in 2014 that such measures have been taken. Poroshenko said Monday he wants to declare martial law "to strengthen Ukraine's defense capabilities amid increasing aggression and according to international law a cold act of aggression by the Russian Federation." 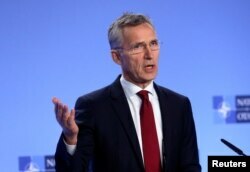 He added that Ukraine intends "to keep adhering to all international obligations." 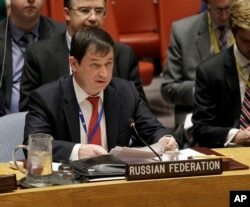 Russian Deputy Ambassador to the United Nations Dmitry Polyanskiy speaks during a U.N. Security Council meeting at United Nations headquarters, Nov. 26, 2018. 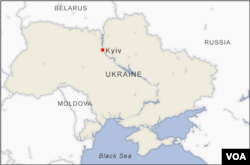 Ukrainian officials say at least six sailors were wounded in the incident. They deny any wrongdoing on Ukraine's part. "We think our sailors committed no crime whatsoever," Ambassador Yelchenko said, noting that Crimea is not recognized as Russian territory by anyone except Russia. "What are they claiming, that Ukrainian sailors committed a crime by crossing the Russian border? Where is this border? It does not exist." Ukrainian Ambassador to the United Nations Volodymyr Yelchenko speaks during a U.N. Security Council at United Nations headquarters, Nov. 26, 2018. "The three sailors, they were acting in provocation and they were conducting a crime according to the laws of the Russian Federation," Polyanskiy told reporters. "Each and every sovereign country has [a] right to prosecute people who conduct crimes and unlawful acts on their territory, that's our approach." ​Russia forcibly annexed Ukraine's Crimea Peninsula in 2014, claiming its ethnic Russian majority was under threat from the Ukrainian government. VOA's Fern Robinson contributed to this report.